If you have ever planted zucchini in your garden, I’m sure you’ve encountered the problem of having way too many gigantic zucchinis. Luckily for you, they seem to last forever. This year, I didn’t plant zucchinis but managed to acquire a zucchini the size of a small child. This thing was crazy big. I used about half of it to make four batches of zucchini muffins, but even after that endeavour, I still had so much zucchini left. After some brainstorming, John and I tried making zucchini pancakes for breakfast. 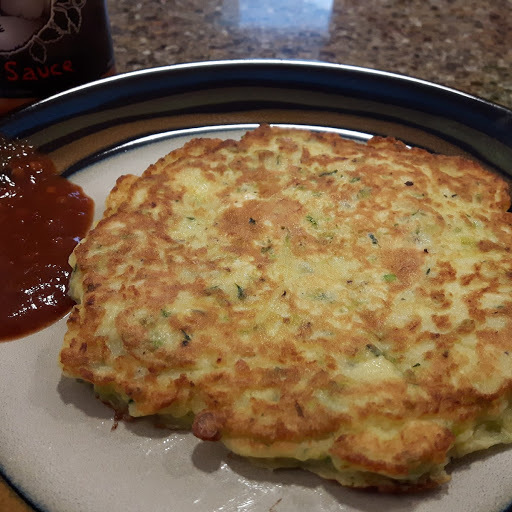 They were such a huge success that I decided to grate and freeze the rest of the zucchini in 2 cup portions and have been thawing them overnight and repeatedly making zucchini pancakes for breakfast! It has become quite the breakfast staple in our household. These zucchini pancakes remind us a bit of the green onion cakes you can buy at Chinese restaurants. The good news about these zucchini pancakes though is that you actually know what ingredients are going in. Whether you have some zucchinis still left over from your garden or see one at your grocery store, this recipe is worth a shot one morning! Lightly salt grated zucchini. Let sit for 30 minutes, then wring out excess water. This step can be done the night before. Alternatively, just try to wring as much water as you can out of the zucchini right after grating if you don’t have time to let it sit. In a medium mixing bowl, beat eggs with fork. Add grated zucchini, green onions and mix well. Add flour, parmesan cheese, baking powder, salt, pepper and herbs. Mix well. Heat oil in a frying pan on medium heat. Put about 1/3 –half of batter on pan and flatten into a pancake if needed. Cook 2-3 minutes per side until pancake turns golden brown.